Seriously! I’m only now realizing how much I truly appreciate a good Dwayne “The Rock” Johnson performance! I once made an offhand joke about him in a trailer for a TV show I was trying to make, however we’re at the point where I’m waiting for him to do a solo movie about Black Adam… but somehow not be in the Shazam movie. It’s important to remember, I’m not here to list the best movies he’s been in. I’m here to talk about 10 times The Rock proved he should be in everything! I know that Dwayne doesn’t get much to do in this movie but I bet everyone knows exactly what I’m talking about when I say, “Aim for the bushes.” Like I bet I didn’t even quote the line properly and you remember how hard you laughed during that scene. He left an impression and he did it next to the great Sammy J in a movie that stars the pretty good, Will Ferrell. Good for you, Mr. Johnson! You may think I’m joking but I legitimately look forward to all Fast and Furious movies. Or at least I have since Hobbs was introduced. If you want to listen to someone who truly loves this movie and the whole franchise check out Kent’s episode of Let’s Discuss Films! I don’t really remember what Hobbs got up to in this instalment but I remember he had like a tag team match with Vin Diesel and I was once again happy that “The Rock” was added to this failing franchise providing genuinely thrilling moments. As will be the case with a couple of other movies on this list, I don’t actually like the movie, but I love Dwayne’s performance. For some context, Be Cool is a follow up to a movie I truly loved called Get Shorty. So I was excited for this movie. I didn’t really know I’d grow to be a “The Rock” fan. I didn’t get into wrestling like Ryan, who loved The Rock. I had only seen him in The Mummy sequel and I didn’t much care for that. However, this movie gave The Rock a chance to show that Dwayne Johnson has true star power and can commit to some pretty goofy ideas with charming results. I don’t even remember what made Gillian and I want to go see this in theatres. I guess it was the 40 Year Old Virgin/Steve Carell love. However, the true stand out for both of us was Dwayne’s Agent 23. 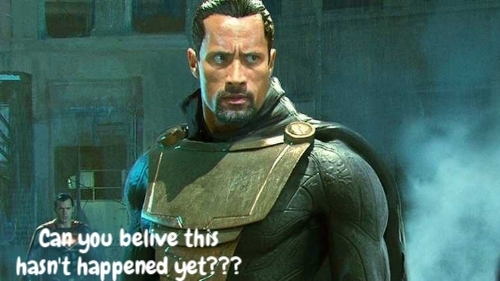 I suppose I should have known he’d be the villain but I was genuinely surprised when it happened and thought it was great how Dwayne played the character so I couldn’t see it coming. it’s a good thing I have no plans on rewatching this so the memory of the performance can stay in tact. I don’t like this movie that much. Listen to me express my feelings on this episode of Spoiled Rotten. But what I think is clear is that Hobbs is a great character. His work with Jason Statham’s character in this movie is great. I usually don’t get excited about proposed spin-offs from franchises but I am all in for Hobbs & Shaw! I’ll never get over how insensitive I thought this movie was. It keeps reminding you it’s a true story and that really made me look at the slapstick violence a type of way. Anyway, Dwayne Johnson was charming in this movie. Plus I think it was the first time I saw him curse consistently and not be the boy scout lead. This was the movie that made me realize I’m a true blue Dwayne “The Rock” Johnson fan. It also changed my mind about the Fast and Furious franchise, but we’re not here for that. We’re here to sing the praises of DJ. The way he showed up in this Paul and Vin vehicle and pulled focus made it clear he’s a winner and a star! I never knew I wanted to see Vin vs. Dwayne (in film not in real life) till the commercials for this movie and I was sold from there. I didn’t see this movie in theatres because I didn’t think anything could come close to the Robin Williams original. The good news is this movie had a fresh take and gives a nice nod to Alan Parish. The thing that really impressed me was how I bought Dwayne as an insecure kid who doesn’t know his own strength. Though people don’t like to talk about it, I feel DJ actually has range. There’s no way you think this performance is the same as what Dwayne does on Ballers. My love for this movie aside, Dwayne Johnson singing a Lin Manuel-Miranda song gets this performance this high alone. What I actually liked about the performance was the layers to the character. Maui wasn’t what I was expecting based on the commercials and that was a welcome surprise. I have actually re-watched this movie recently so I can say full confidence that this is the best Dwayne Johnson performance. He gets to show off all of his strengths. There’s lovable goof, menacing strong man and some stuff in between that deals with how people can let bullying affect the way they see themselves even if they look like “The Rock.” I came in for the amazing concept of a Little Heart, Big Johnson and stayed for the genuinley great performance from Dwayne that had me guessing till the end.